CINCINNATI - It’s the easiest question Napheesa Collier, Katie Lou Samuelson, and Crystal Dangerfield have had to answer during their time with the UConn women’s basketball team: Will you ever ask coach Geno Auriemma to take you out of a game to rest? “No I won’t,” Dangerfield said. But after playing 40 minutes Thursday night at Louisville then returning to the court 39 hours later to face Cincinnati at Fifth Third Arena Saturday afternoon, Dangerfield was having second thoughts. 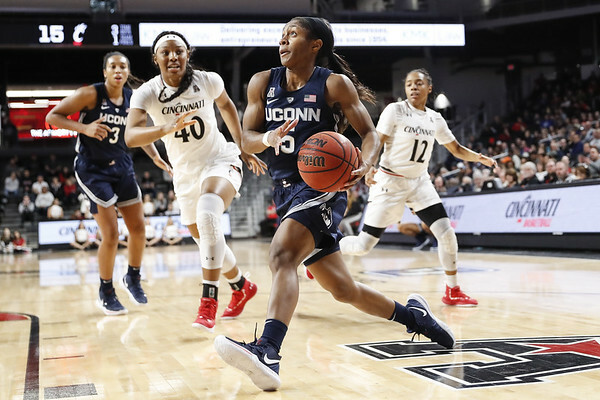 Auriemma did give his junior point guard a break with 5:14 left in the fourth quarter and the Huskies up by 11, thinking he would get her back in after the media time out that would come with the next dead ball. But after the defense allowed a Nikira Goings’ 3-pointer, Auriemma knew Dangerfield had to return - now. Her break lasted 28 seconds. Collier and Samuelson went the full 40 Saturday in UConn’s 65-55 AAC win over the Bearcats. Samuelson also didn’t come out of the Louisville game while Collier got about two minutes off at the end of the first half as she had two fouls. The Huskies have played eight of 12 games on the road following the end of fall semester final exams and it shows. “I was pretty tired, but we have to be able to focus through that,” Collier said. “We were making a lot of mental mistakes. Just because our bodies are tired, it doesn’t mean we have to let our minds go. That’s when we have to be even more mentally tough. UConn (19-2 overall, 8-0 AAC) will start a three-game homestand - its longest of the season - Wednesday against East Carolina at the XL Center then host Temple at Gampel Pavilion Saturday before returning to the XL to take on South Carolina a week from today. After the Gamecocks leave, the Huskies will get five more days on campus before getting back on a plane to Orlando for a showdown with Central Florida. Meanwhile, the gap between the starters and the reserves is wider than ever after the bench showed a little bit of life during a mid-January stretch. Kyla Irwin and Olivia Nelson-Ododa were the only substitutes that got in and it was like they couldn’t get taken out fast enough. Mikayla Coombs, Molly Bent, and Batouly Camara did not play. So any thought of a shake-up in the lineup with freshman Christyn Williams continuing to struggle is likely not going to happen. “We are what we are and we have what we have,” Auriemma said. “It’s not going to change. You can’t try to make something that’s not there. You’ve got to deal with what you have. That’s what our goal is right now - take what we have and get better at it. Not that it would do any good. “There are 365 Division I teams in America, and 364 of them would trade places with me in a heartbeat,” Auriemma said. Collier did become the 11th UConn player to reach 2,000 points and the fifth with 2,000 points and 1,000 rebounds. Dangerfield did have an uncharacteristic four turnovers but made four steals and had five assists to go with her 17 points. Megan Walker posted a double-double (10 points, 10 rebounds) but could have put up big numbers had she finished better inside. Meanwhile the slumps for Samuelson and Williams continued. The Huskies will take a hit in the AP poll released today and could drop out of the top four for the first time in seven years, though their losses will have been to the No. 1 and No. 2 teams. That win over Notre Dame, though, seems a long time ago. “Just because we won at Notre Dame the expectation was, ‘Oh, wow, same old same old UConn,’ ” Auriemma said. “Maybe Notre Dame had something to do with that game as much as we did. You don’t know. Posted in Newington Town Crier, UConn on Monday, 4 February 2019 21:15. Updated: Monday, 4 February 2019 21:18.